Senator Dino Melaye, representing Kogi West senatorial district in the National Assembly, In a series of tweets on his twitter handle on Monday evening alleged that the police arrested his brother, Moses, and his friend in front of his house. The Senator also claimed that his police orderlies had been withdrawn and that there was a plan to kill him. 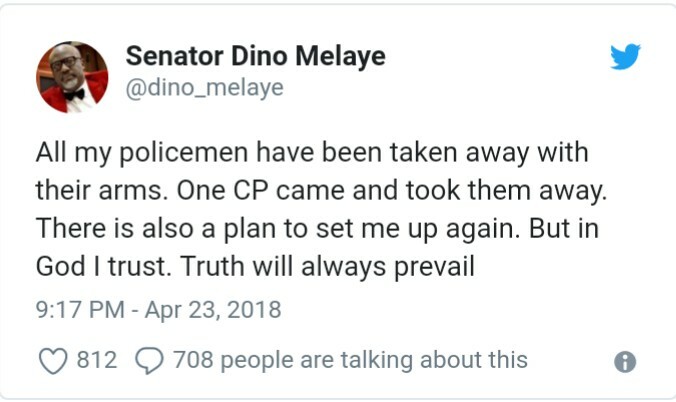 Dino had in his latest tweet promised to himself available to the police today stressing that his resolve to speak the truth and defend the poor masses of Nigeria is total. The tweets read, “All my policemen have been taken away with their arms. “One CP came and took them away. There is also a plan to set me up again. But in God I trust. Truth will always prevail. The tweets followed police siege at No 11 Sangha Street, Maitama Abuja residence of the on Monday. Police had besieged the residence of the senator by blocking both ends of the street where the house is located with their vehicles. They also initially prevented persons in the building from going out. But in support of the Senator was a group of Internally Displaced Persons (IDPs). The militant IDPs said that they will resist any attempt to arrest the senator by the police, adding that he has been on the side of the masses. They defied armed policemen, chanting solidarity songs in support of Dino and vowed not to leave until police vacate the house. The entire street was thrown into confusion as residents and passers-by were not allowed to have access to the street. Addressing journalists, the Chairman of IDPs, Kushigoro Camp, Philemon Emmanuel, said that senator Dino Melaye has been their only benefactor who comes to their camp once in a month to give them food, drugs, and other items. "We heard that they have arrested senator Dino Melaye because of the truth he has been speaking. 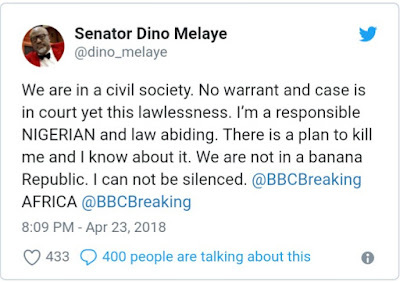 We have not seen any senator that can speak the truth like Dino. “So, anything that will happen to him should happen to us. We have more than 36 camps in Abuja and Nasarawa. Is only Dino Melaye that can visit the IDPs. He gave us food items, drugs, and books for our children. We will not allow anything to touch him, “ Emmanuel stated. Lawyer to Dino Melaye, Barr. Ajayi Samuel Jaiye said the siege is a gross violation of the Senator's fundamental human rights. He noted that the police have not invited the senator formally neither has there been any warrant issued against him to warrant the harassment. He added that the whereabouts of his client is still unknown. Investigation, however, revealed that the Senator was in the house while the hide and seek game lasted. 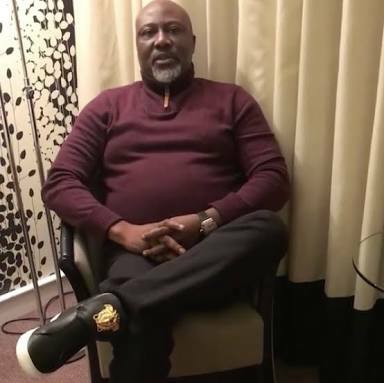 Dino was on Monday morning prevented from traveling to Morocco at the Nnamdi Azikiwe International Airport by the security operatives. He broke the news of on his twitter handle. But Melaye was said to have ‘escaped’ from the airport, resulting in the invasion of his residence by the Police. The Deputy Force Public Relations Officer, Adeniran Aremu, said the Senator was indicted for possession of illegal firearms and had refused to honor police summons over the alleged crime. “We have invited him twice, but he refused to honor our summonses, that is why we have sent our men to arrest him. They are at his residence and they will not leave until they have apprehended him,” he said. It will be recalled that a suspect, Kabiru Seidu, had alleged that the Senator met him and his gang of thugs, in 2017 and gave him a bag containing an AK-47 rifle, two pump action guns and N430,000 to share with his boys in Abuja. He said the Senator asked his gang to start working for him as political thugs.